When the discussion turns to performance parts for cars, one of the first items that comes to mind is replacement fuel pumps. As logic would dictate, the more powerful the fuel pump, the more gas gets to the engine. But if a fuel pump does not get the fuel from the gas tank to the engine of the car, then you're in trouble. So when a fuel pump is faulty, damaged, or failing, the best move is to replace it with one that is in good condition and able to do the job. There are many reasons that a fuel pump would not work properly and that replacement fuel pumps would be needed. For now, let’s look at just three of the most common, telltale signs that indicate it might be time for replacement fuel pumps in cars. It is true that there are many reasons that a car engine might not start. It could be the ignition, the alternator or the battery to name just a few possibilities. But also, the fuel pump should be considered. It may need replacement. A comparison can be made in this case between a person and a car. Just like an individual who is not getting enough air in their lungs to run up a hill, if a car engine is not getting enough gas it will strain when going up a hill. In instances such as these, safety becomes a concern and replacement fuel pumps should definitely be considered. The fuel line of a car can’t do all the work alone. The fuel filter of a car can’t do it all, either. No one part of the car engine can do it alone. Everything is designed to work together. If a car sputters, it means there is not enough gas flowing smoothly into the engine. The fuel pump should be checked to see if it needs to be replaced. To sum up, the best way to keep a car engine in great working order is through regular upkeep and maintenance. 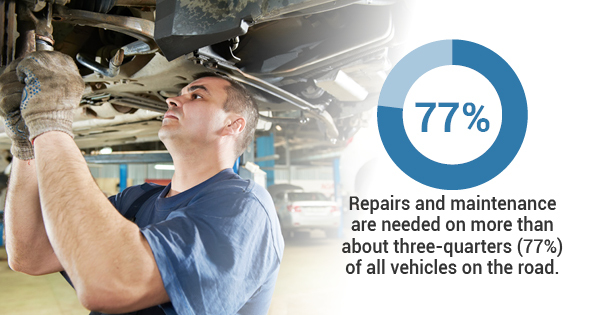 As it stands now, it has been reported that repairs and maintenance are needed on more than about three-quarters (77%) of all vehicles on the road. Checking on the fuel pump is a key step in making sure that the engine will perform powerfully and that all has been checked to ensure a safe ride in the car.